A few weeks ago, I finally was able to try out West Roxbury’s newest restaurant addition: Skara Grill. Located in the old Friendly’s building on Centre Street, Skara serves up traditional Greek cuisine in a casual setting… and they even have an outdoor patio and a beer and wine license! 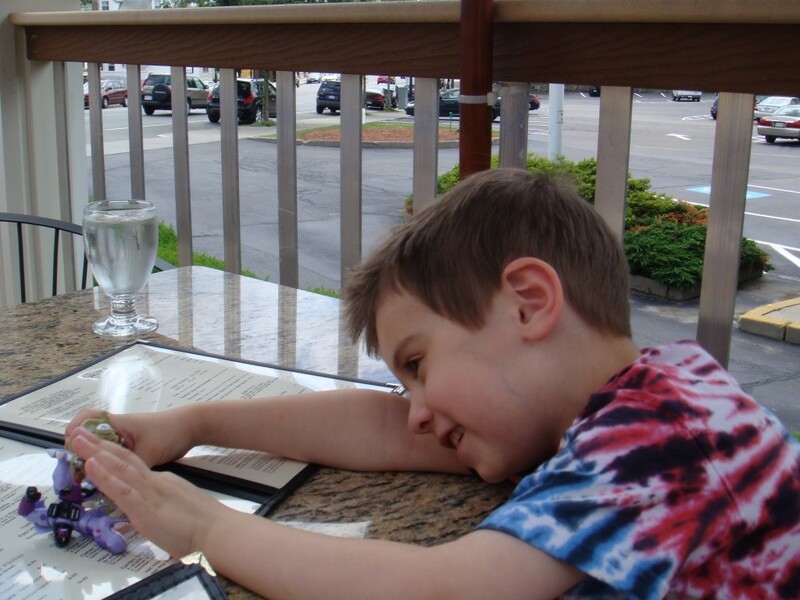 We opted for lunch one weekend afternoon with the 4-yo and chose to sit out on the patio. The interior of the restaurant has a Greek diner feel to it, with a casual atmosphere and a tasteful dining room. The exterior of the building is nicely landscaped and the owners clearly took the extra steps to remove all traces of the previous divey-ness of the place. It’s clean, well cared for and very inviting. Serving the finest authentic Greek cuisine West of Greece. 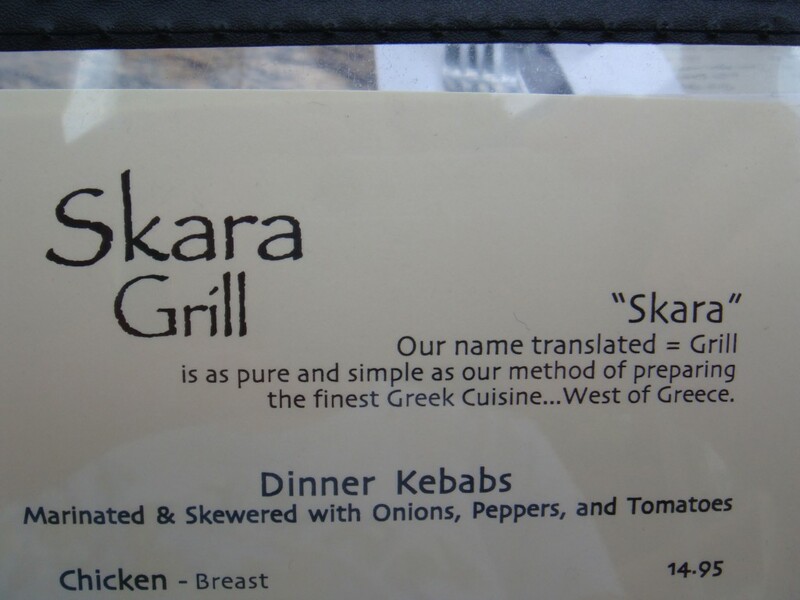 Our name “Skara” is the Greek word used to describe the “grill basket” that the ancient Greeks would use to hold and grill various meats, seafood, and poultry over an open flame. Although the advancement of cooking technology has come a long way since then, we still savor the taste of food prepared over an open flame, paired with flavor filled vegetables infused with imported Greek spices, such as mountain grown oregano and Kalamata olive oil. Yes… our Greek cuisine is so good you’ll want to break your plate and do a little dance when you’ve finished. But please… please… don’t break our plates. Do feel free to shout out… Opa!!! Come to Skara Grill and experience the best Greek food west of Greece for yourself. The menu is broken out into several sections: Mezes (appetizers), Meze Thalassas (seafood appetizers), Meze Pikilias (Greek appetizer spreads), Soupa (soup), Yevmata (main entrees), Salata (salad), Skara Kebabs, Sto Plie (side orders) and desserts. Many of the main entrees have a little “v” next to them, indicating you can also request to have the meal made vegetarian. 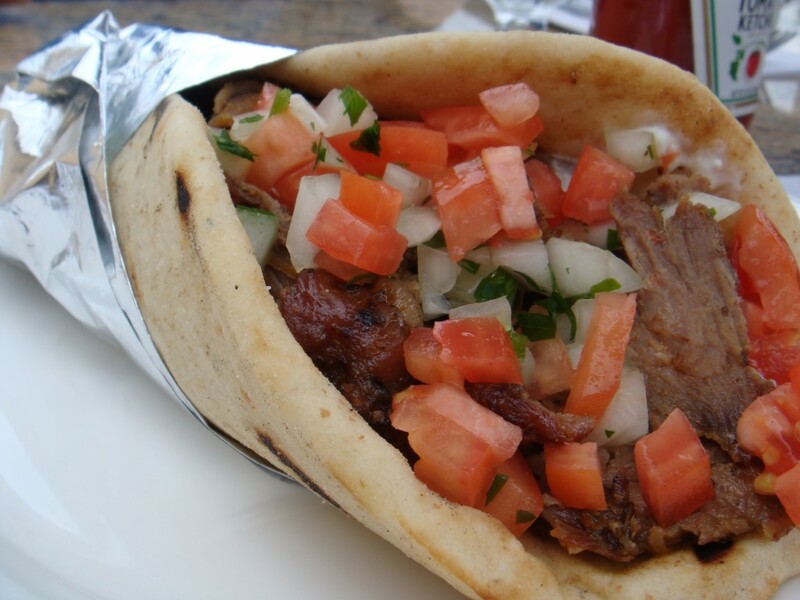 There are many traditional lamb and meat dishes, as well as seafood, pitas, gyros and sandwiches. 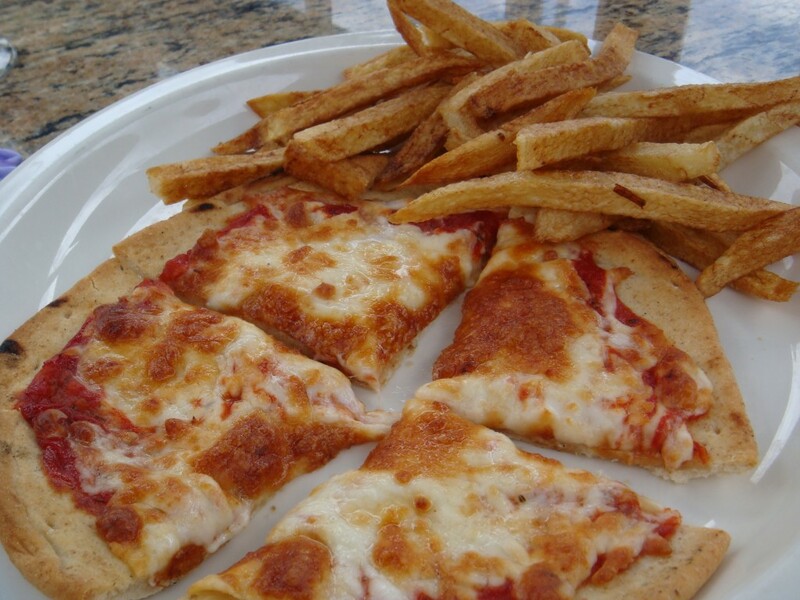 The 4-yo ordered the Pita Pizza ($4.95) and a side order of French Fries ($2.95). The Husband, being deprived of meat at home, went for the standard Gyro (pronounced “Yee-Ro”) — vertically grilled, spiced blend of layered pork and beef, served with a mixture of tomato, onion, parsley and Tzatziki (Greek yogurt, cucumber and garlic spread — a personal favorite) for $6.95. It was absolutely delicious. Everything was super fresh, well seasoned and cooked perfectly. I wanted to try a few things, so I opted for the Pikilia (Greek spread plate) — an assortment of traditional Greek spreads, including Tzatziki, Tirokafterie, Taramosalata and Melitzanosalatafor$12.95. 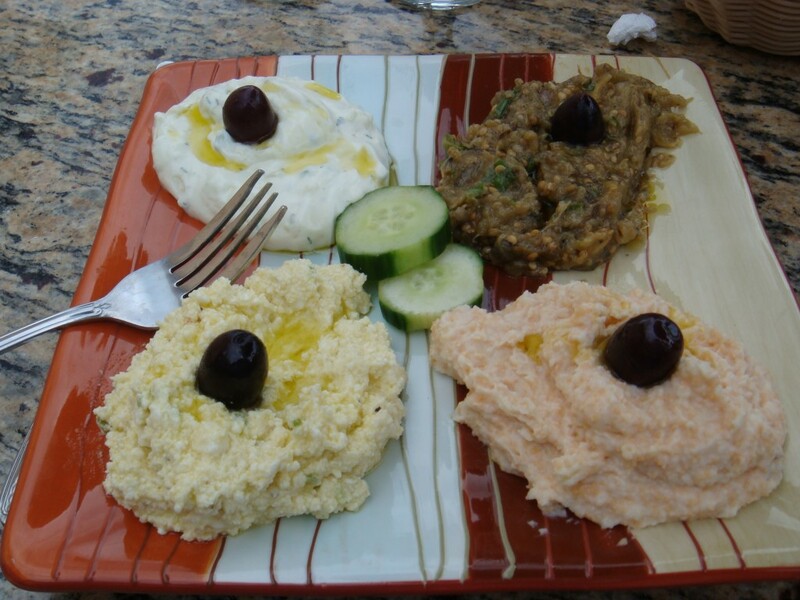 As mentioned above, Tzatziki is a mixture of Greek yogurt, cucumber and garlic; Tirokafterie is a blend of feta cheese and hot pepper; Taramosalata (another personal favorite), when made traditionally, is a mix of red caviar and whipped potato; and Melitzanosalata is a roasted eggplant and garlic spread. The dish was served with a basket of warm, freshly made pita bread. These spreads are so rich that I couldn’t even finish half my plate. They were all delicious… but definitely not low on the fat and calorie scale! The menu has several other dishes I would love to try, including the Garides (Shrimp Santorini) — jumbo shrimp sauteed with red sauce, wine and topped with herbs and feta cheese ($18.95). We went to Santorini as part of our 3-week honeymoon (back in 2003) and I would love a reminder of that trip. The kebabs ($14.95-$16.95) sound great, as do many of the lamb dishes. Skara serves lunch Monday through Sunday, 11am to 4pm and dinner Monday through Sunday, 5pm to 10pm. You can also “friend” them on their Facebook page.